Coalbed methane (CBM) is an unconventional natural gas that contains virtually 100% methane (CH4). During the coalification process large quantities of methane gas are generated and stored within the coal on its internal surfaces. Because coal has a large internal surface area, it can store large amounts of methane-rich gas, or up to six or seven times what a conventional natural gas reservoir of equal rock volume can hold. As methane has become a lucrative source of fuel, coal bed methane has been captured from existing coal mines, coal seams not yet mined, or from coal seams that are uneconomical to mine. CBM is almost identical to conventional natural gas and is utilized for the same end uses, such as heating homes, cooking, and electricity production. Currently, CBM accounts for approximately 7% of the total natural gas production in the United States. 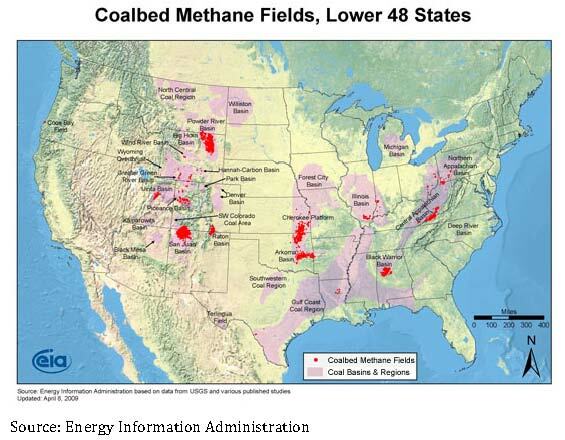 With 13% of the United States containing coal in its subsurface, coal bed methane gas has the potential to become a large part of domestic energy supply. In conventional gas wells the pressure of the gas within the reservoir is what drives the gas into the wellbore and up to the surface. CBM, on the other hand, is held in place within the coal seam by pressure that water exerts. Therefore, for the CBM to flow out of the coal seam the excess water holding it in place must be removed. This is done primarily by utilizing an open hole completion technique, where a submersible sump pump is at the bottom of the well. The sump pump removes the water from the coal seam; this reduces the pressure within the coal formation, allowing the methane to flow freely to the surface where it can be compressed and sent to market via pipeline. Initially, when a CBM well is completed, water is produced in much larger quantities that the gas. 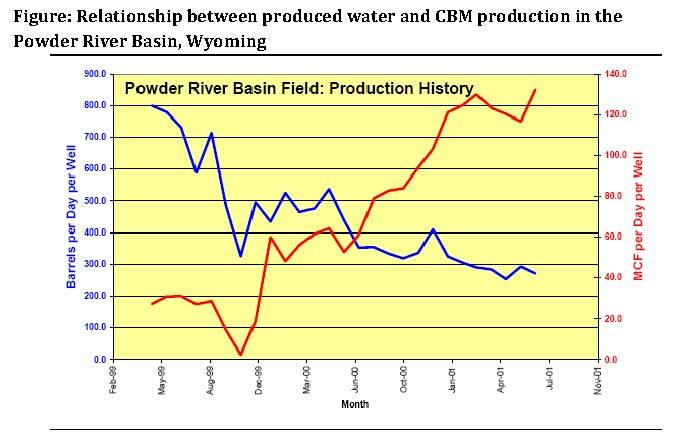 As the formation is dewatered, CBM production rises and water production decreases. The well density of a CBM field is often higher than a conventional natural gas field. One section (640 acres) typically contains eight CBM wells, compared to just one conventional gas well per 640 acres. However, spacing regulations are put forth by the Oil and Gas Commissions of the state and producers can petition the Commission if there is sufficient geologic and engineering evidence that warrants wells spacing deviate from the stated spacing rules. As a point of comparison, oil well spacing is generally one well per 40 acres in Wyoming. Another notable difference between conventional natural gas wells and CBM wells are the depth at which they are completed. 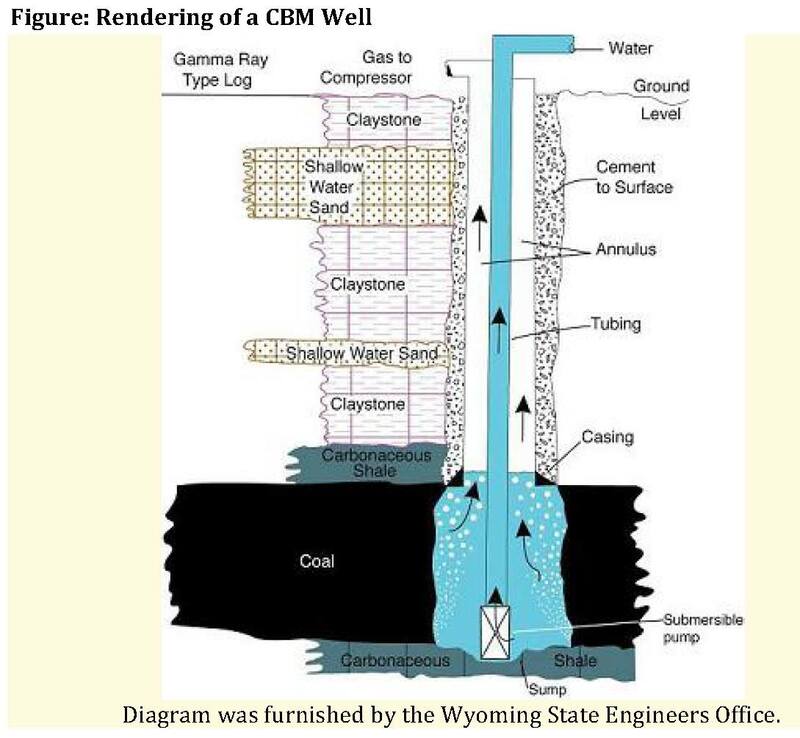 CBM production generally targets shallow coal seams; in the Powder River Basin of Wyoming, for instance, the depth of the coal seams vary within the basin, therefore the CBM well depths currently range from around 1000 feet to over 2000 feet. This is quite shallow compared to conventional natural gas wells that are found in the Jonah Gas Field in Wyoming, where well depths are 8000 to 12,000 feet. CBM is currently in production all over the world. The United States, Canada, Australia, China, India, and New Zealand are some examples of where CBM production is taking place internationally. In the U.S., CBM production dates as far back as the 1930s in the Appalachian Basin. In the 1950s the San Juan Basin of Colorado and New Mexico saw CBM activity that has continued through to today. However, CBM production didn’t take off with much economic success until the 1980s, when Congressional tax incentives for unconventional natural gas production were enacted. Today there are thousands of CBM wells across the country, with exploration, development, and/or production in 22 states. Around 88% of total U.S. CBM production occurs in the Rocky Mountain region, which includes Colorado, Montana, New Mexico, Utah, and Wyoming. Colorado, Wyoming, and New Mexico are currently the top three CBM producers in the country (Table 1). As the production of unconventional natural gas like CBM increases, concerns over surface impacts of wells, roads, and facilities associated with CBM development have risen. There is also widespread concern over the protection of groundwater and the responsible management of the large amount of produced water associated with CBM development in the western U.S. Though many of these issues are also associated with conventional natural gas development, CBM tends to have a larger amount of produced water associated with its development. The amount and quality of CBM produced water varies widely from location to location, even within a basin. Water produced through CBM development is of varying quality – at times it is suitable for human consumption, and other times it is very high in salts (Na+) and total dissolved solids (TDS). Management of produced waters is contingent on the quality of water, and ranges from direct discharge and irrigation to reinjection into the deep subsurface. Other uses of produced water include use of water for livestock, impoundment in storage ponds, and dust control. The most productive CBM areas are located in the arid west, where the large quantities of produced water pose a management challenge and opportunity. The arid West’s alkaline soil system cannot handle large influxes of salts without some type of soil amendments, which at times makes direct discharge of CBM produced waters difficult. When handled responsibly, however, the produced water can potentially be beneficial to western agricultural producers who are constantly in need of more water. Management techniques for produced water are constantly evolving. The different storage methods used for CBM produced water can potentially be problematic. For example, on-channel reservoirs, which are manmade reservoirs built to hold large quantities of coal bed methane produced water have a propensity to leak if not properly lined. Discharge of wastewater is also controversial and being addressed in an EPA rulemaking for wastewater from unconventional extraction operations. Source: ALL Consulting, Tulsa, Oklahoma. (2003, July). Handbook on Coal Bed Methane Produced Water: Management and Beneficial Use Alternatives. Section 404 of the 1987 Clean Water Act: CBM extraction is controlled by water quality standards so that designated uses of water are protected. Federal Safe Drinking Water Act, Environmental Protection Agency Underground Injection Control (UIC) Program : Regulates the re-injection of produced water from CBM production. Code of Federal Regulations (40 CFR Part 435) : requirements for produced waters from the oil and gas industry are defined. The following were used in preparing this page and will also provide additional information.